We're excited to announce that we're hosting a panel at Galacon 2015! Taking place from August 1-2 in Ludwigsburg, Germany, you'll be able to see some of our team members showcasing the biggest updates coming to Legends of Equestria while discussing the work that goes into creating a game of this scope. To learn more about GalaCon, check out their site at http://www.galacon.eu/! But that's not all! We'll also have our very own table at the GalaCon games room, where you can stop by at any point throughout the convention and check the game out for yourself! Not attending GalaCon? No problem, because from August 14-16 we're opening the servers so anyone can come online and see how Legends of Equestria has changed and improved! We hope to see you soon, whether it's at GalaCon or in LoE itself! Legends of Equestria at Everfree Northwest 2015! We're happy to announce that members of the Legends of Equestria team are coming to Everfree Northwest 2015! You'll find us in the Horizon room from 14:45-15:45 on Sunday, May 31! We'll answer questions, show off some of our newest features and generally have a fun time! Memories of the Open Server Event! I've been loving all the pictures and stories you've all been posting, so I decided to post some of my own! I was overwhelmed with just how many of you there were! It was amazing meeting so many new friends! We decided to make a heart shape - out of ponies! If any Pegasi got a better view, I'd love to see it! More dancing with my new friends! Next, we decided we'd meet by the fountain and play some games. We played Hide and Seek in the mine. I got found really fast, but it was a lot of fun! Next was the pony conga line. It lasted through the night and into the next morning! Sugarcane Corner was the place to be. Lots of pictures from the party we had there! We had a Fluffy visitor come to the party, but she ran around so much it was hard to get a picture! This is the last one I got before the weekend ended, I had so much fun! The Open Server Event was an amazing experience, and I can't wait for the next one! Meeting you ponies was so incredible, I only wish I could have met you all! If you�ve got any memories to share, you can post them in this thread on our Forums, or tweet them to us at @LegendsofEq. I�d love to see them! The Open Server Event is almost upon us now over! Thanks again for all your support everyone! 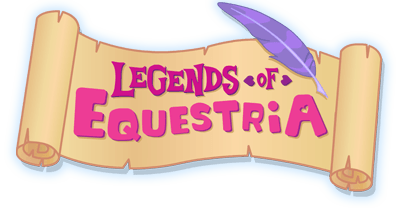 Legends of Equestria at BABSCon 2015 & Open Server Announcement! BABSCon is coming up in April! For those of you going, we wish you a safe travel and a happy time down at the convention. If you haven't heard yet, we'll be making our way down there as well! You'll be able to meet and talk with the ponies who help make the game possible and prod them with thousands of questions. If you're not joining us at BABSCon, fear not; you'll be able to enjoy our panel through the magic of the internet, where we'll be discussing all sorts of cool stuff about the game and perhaps leak some cool secrets! Err, I mean, what secrets? We don't have any secrets! Legends of Equestria does not comment on rumors and speculations relating to the game. Mmm, yes, quite. Anyway, the panel happens at 1:30 PM PDT on Friday April 3rd so we hope to see everypony there! After the convention, we hope you'll still have some room left for more fun! We're happy to announce that we'll be having another Open Server Event on April 10-12! It will be a chance to try out some cool new features we've been working on in the game, as well as experience all the content we've offered in the past. Just in case you missed any of it! We'll be providing more information, and the download links, closer to the event, so stay tuned! April is going to be an exciting month for Legends of Equestria and we hope to see you all join us for the fun! Now if you excuse me, I need to get ready to meet up with Golden Gates!